Cats are losing their lives at an alarming rate in New Jersey animal shelters. Approximately 23,000-24,000 cats or nearly half of the cats coming into New Jersey animal shelters in 2013 were killed, died or went missing. This blog explores the reasons why this tragedy is occurring and whether we can end the massacre. Additionally, I’ll try and answer the question whether shelters need to resort to neutering and releasing healthy friendly cats or not impounding these cats at all to avoid killing cats in shelters. The first analysis assumes TNR could be implemented and would result in fewer New Jersey cats for shelters to place. In my next blog, I will estimate the impact of a high volume targeted spay/neuter program. Generally speaking, this analysis requires many animal control shelters to adopt out more cats, send fewer cats to rescue, and rescue more cats from other shelters due to the extra shelter space resulting from lower local cat intake. In other words, this analysis would require shelters to achieve higher performance targets. The second analysis assumes local laws cannot be changed and shelters are stuck receiving unadoptable feral cats. Unfortunately, I do not have the data to calculate the percentage of truly feral cats received at each New Jersey animal shelter. Based on an analysis of Michigan animal shelter data, Nathan Winograd estimated at least 6% of cat intake at Michigan animal shelters are truly feral cats. Similarly, Wisconsin’s Clark County Humane Society 2014 cat statistics show feral cats who were trapped, vaccinated and returned to the community made up 7% of cat outcomes. Based on these numbers and the success of barn cat programs in Pflugerville, Texas and the Maryville, Tennessee area, barn cat programs should be able to save most feral cats in similar communities. On the other hand, California’s Orange County Animal Care reported approximately 24% of the cats it took in during 2012, which was before it practiced TNR, were feral and euthanized. However, I suspect at least some of these cats were fearful rather than truly feral and could have been socialized and eventually adopted out. My model assumes shelters are doing the proper thing and practicing TNR and placing the reasonable number of feral cats received as barn cats. Obviously, many shelters do take in a good number of feral cats due to poor laws or misguided policies. 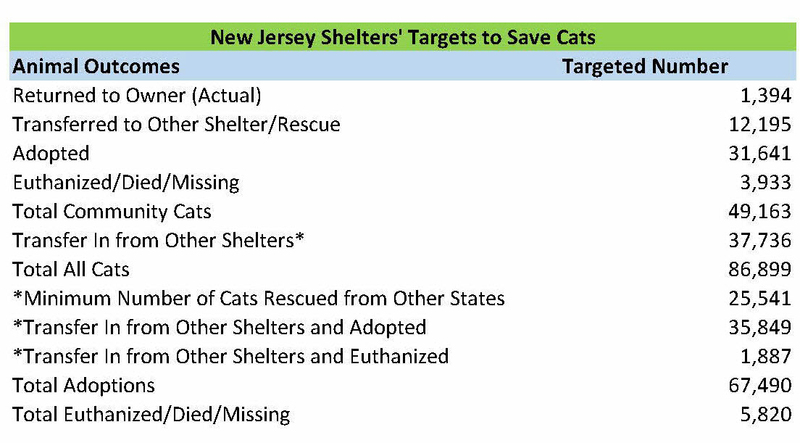 As a result, the number of New Jersey cats killed may be higher than my model predicts for some shelters. My model’s results using total cat intake rather than assuming a larger percentage of feral cats will not be too much different for the targeted adoption and euthanasia rate metrics. The Life Saving Model assumes euthanized cats stay at shelters for 8 days (i.e. euthanized immediately after the 7 day hold period). Many shelters will have a lot of extra space free up if more cats are feral and killed since the net impact will be moving local cats from adopted (assumed length of stay of 42 days) to killed (assumed length of stay of only 8 days). This creates extra space that my model assumes shelters use to rescue and adopt out cats from other places. For example, if I assume New Jersey animal shelters have a local cat kill rate of 30% as opposed to 8% due to more feral cats, total cat adoptions (New Jersey plus other states) will only be 2% lower and the kill rate would only rise from 7% to 16% for the New Jersey shelter system. A few space constrained shelters with high feral cat intake would have a significant increase in the targeted number of cats euthanized and a decrease in cats needing rescue due to cats moving from sent to rescue (assumed length of stay of 8 days) to euthanized (assumed length of stay of 8 days). However, on a statewide basis, shelters with excess capacity would partially offset this increase in the kill rate by rescuing and adopting out cats from shelters outside of New Jersey. Thus, the difference between my model’s assumed and actual feral cat intake will not have too much of an impact on the targeted cat adoption number and kill rate. New Jersey’s animal shelter system has enough space to save most of the state’s healthy and treatable cats. 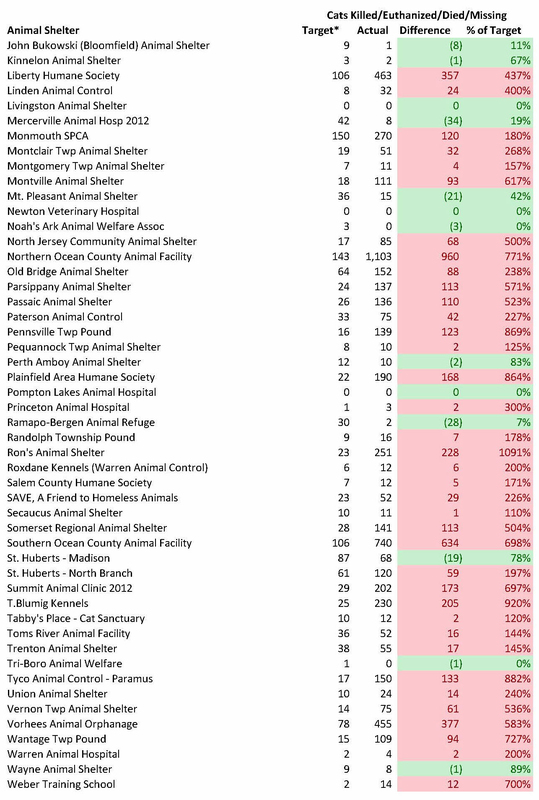 The table below details the targeted numbers of cat outcomes the New Jersey animal shelter system should achieve. Out of the 49,163 New Jersey cats coming into the state’s animal shelters in 2013, 31,641 and 12,195 cats should have been adopted out and sent to other shelters/rescues by the facilities originally taking the cats in. However, other New Jersey animal shelters had enough capacity to rescue 37,736 cats or three times the number of cats needing rescue from space constrained facilities. Unfortunately, some of the cats needing rescue, such as very young kittens, should not go to a shelter and still must go to either a kitten nursery or foster homes. That being said, many adult cats are in fact killed in New Jersey animal shelters and many facilities with excess space could save these cats. Certainly, some New Jersey animal shelters do pull some cats from New York City and Philadelphia animal control shelters. Even if I assumed all of the out of state cats rescued by New Jersey animal shelters came from New York City and Philadelphia, that number is only 8% of the number that New Jersey shelters could rescue from New York City and Philadelphia animal control shelters. While some of these cats from New York City and Philadelphia animal control shelters are young kittens which should not go into a normal animal shelter, many other cats could go to New Jersey animal shelters and be adopted out. As a result, the additional number of cats New Jersey animal shelters could save from New York City and Philadelphia is not much lower than the figures above. Thus, New Jersey animal shelters could make New Jersey a no kill state for cats and help other states reach that goal as well. Additionally, the adoption target, 7.6 cats per 1,000 people, I set out for New Jersey animal shelters is only slightly higher than the state of Colorado’s per capita cat adoption rate of 6.5 cats per 1,000 people. Given Colorado still has some regressive animal shelters and only a 79% live release rate for cats, Colorado’s per capita cat adoption rate can increase. Thus, the cat adoption targets I laid out for New Jersey animal shelters are quite achievable. The table below compares the targeted and actual number of cats euthanized/killed, and who died or went missing. 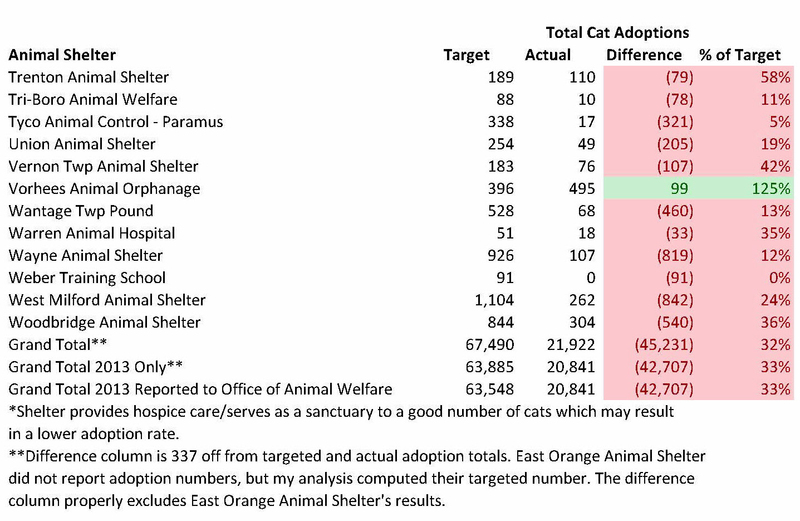 In order to better compare the targeted and actual numbers, I only calculated the target number (8% euthanasia/death rate) based on the number of cat outcomes at each shelter. The Life Saving Model also targets a 5% euthanasia rate for additional cats rescued, but this would overstate the total targeted number of cats euthanized in this comparison. In other words, the targeted number of euthanized cats would be higher due to more cats being rescued as opposed to having a high kill rate. All cats missing are assumed “dead” based on the assumption they died or went to a very bad place. 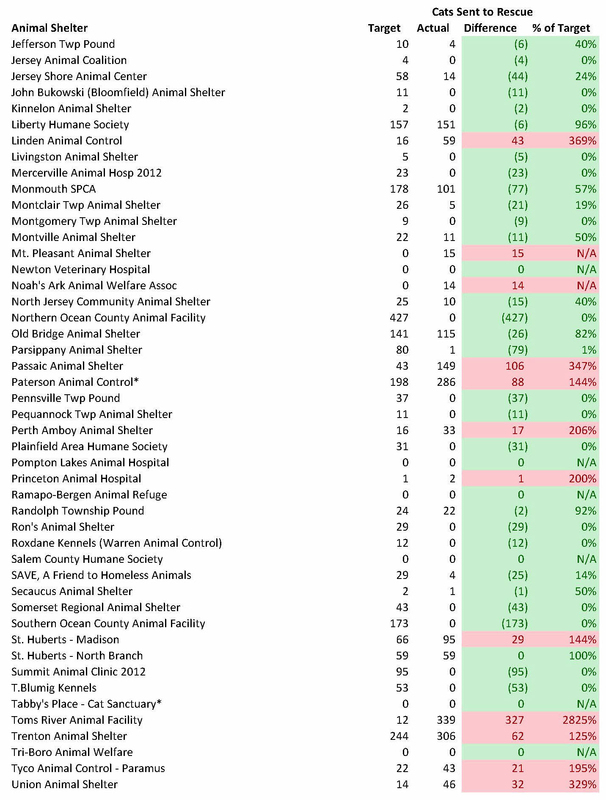 Shelters having less and more than the targeted amount of cat deaths are highlighted in green and red in the table below. The overall results show too many cats are unnecessarily losing their lives at New Jersey animal shelters. Based on the assumptions above, 18,877 savable cats lost their lives or went missing at New Jersey animal shelters in 2013. If I only count shelters where actual deaths exceeded the targeted deaths, the number of savable cats who lost their lives rises to 19,078. Obviously, some of these cats are truly feral who require TNR or placement as barn cats, but surely many others could be adopted out. Thus, New Jersey’s shelter system is failing its cats. Several animal shelters in South Jersey and elsewhere account for a large percentage of the savable cats unnecessarily losing their lives. Specifically, Atlantic County Animal Shelter, Burlington County Animal Shelter, Camden County Animal Shelter, Cumberland County Animal Shelter and Gloucester County Animal Shelter account for 9,707 of the or 51% of the 19,078 cats needlessly losing their lives. Associated Humane Societies three shelters had 2,059 cats unnecessarily lose their lives. Northern Ocean County Animal Facility and Southern Ocean Animal Facility had 1,594 cats lose their lives needlessly in 2013. Bergen County Animal Shelter, which happens to serve many towns in one of the country’s wealthiest counties, had 649 cats unnecessarily lose their lives in 2013. Collectively, these 11 shelters are 11% of the state’s shelters and account for 14,009 or 73% of the cats needlessly losing their lives. Rescue oriented shelters generally had fewer cats lose their lives than targeted. While saving large numbers of cats is what we all want, some of these shelters may have achieved this result by taking in easier cats. Austin Pets Alive, which is a rescue oriented shelter in Texas, has developed some of the most innovative cat programs and only had a cat live release rate of 93% in 2013. This was due to Austin Pets Alive taking in many cats requiring significant treatment, such as neonatal kittens, from the city animal control shelter. As a result, some of the rescue oriented shelters with significantly fewer cats euthanized than targeted may have avoided taking in many of the more difficult cases. Several animal control shelters euthanized fewer cats than the number targeted. Denville Animal Shelter, Ewing Animal Shelter, Byram Township Animal Shelter and Wayne Animal Shelter prove municipal animal shelters can avoid killing healthy and treatable cats. Furthermore, Perth Amboy Animal Shelter shows even a poorly funded shelter serving an area with a high poverty rate can avoid killing healthy and treatable cats. Mercerville Animal Hospital, which only reported data from 2012, also euthanized far fewer cats than targeted at its shelter. This shelter had an animal control contract for the first seven months of the year. While St. Huberts – Madison outperformed its targeted euthanasia number, St. Huberts – North Branch underperformed by a greater amount. Humane Society of Ocean County also euthanized far fewer cats than targeted. While Jersey Animal Coalition and John Bukowski Animal Shelter (Bloomfield) reported fewer than targeted cats losing their lives, I do not trust these organizations numbers due to the turmoil at these shelters during this time. Some animal shelters will require more support from rescues and animal shelters with excess space than others. If a shelter has relatively high intake and very limited space, it will need more help than other shelters. While sending animals to rescues is a good thing, we do want shelters most needing rescue support to receive that help given rescues have limited resources. The table below compares the number of cats a shelter should transfer to other organizations per the model and the number of cats actually sent to other animal welfare groups. Shelters marked in green are receiving less than the expected rescue support while facilities marked in red are receiving too much rescue help. Overall, New Jersey shelters are not receiving enough help from other animal welfare organizations. While the overall number of cats rescued was about 37% of the amount needed for the state as a whole, the actual number was 28% since many cats were rescued from facilities which did not require so much rescue assistance. Only 18 out of the 84 facilities received the required rescue support. In other words, only 21% of the animal shelters needing rescue support received the amount these facilities require. We truly need to understand the reasons for this rescue shortfall. While poor data collection (i.e. 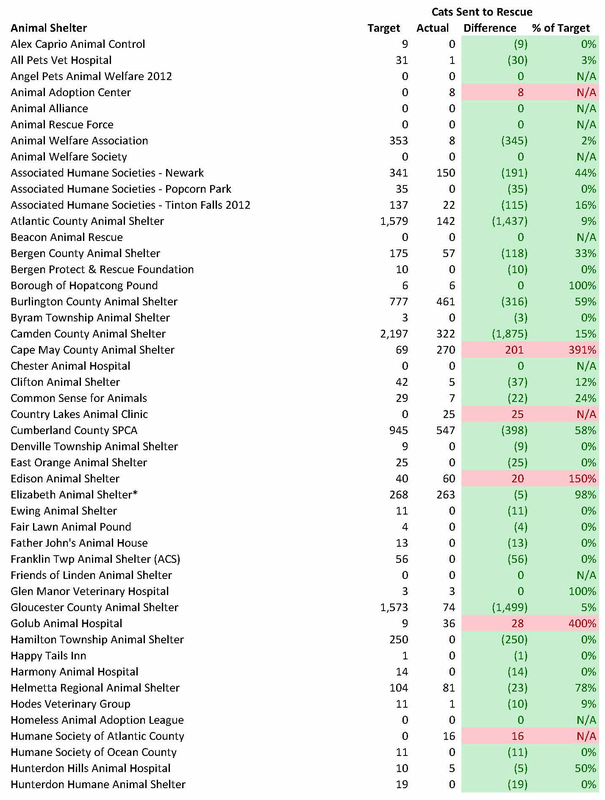 shelters classifying rescues as adoptions) may explain part of this rescue deficit, the large size of this number points to other causes as well. For example, New Jersey shelters received 89% of their dog rescue needs, but only 37% of their cat rescue requirements. Certainly, some of these cats are feral and not candidates for most rescues. However, many other cats surely are home-able. Many high kill facilities may not reach out to rescues for cats, such as during kitten season, as much as they do for dogs. This data supports the need for the Companion Animal Protection Act (“CAPA”), which requires shelters to contact rescues and other facilities at least two business days before killing animals. On the other hand, shelters with excess capacity may not be doing their part to save cats from space constrained facilities. While Cape May County Animal Shelter is known as a progressive shelter, the other facilities are not good in my opinion. Local activists have campaigned to remove Toms River Animal Facility’s Shelter Director, Jim Bowen. Passaic Animal Shelter has no volunteer program or even a social media page. Paterson Animal Control also has no volunteer program, no social media page or even a website with animals for adoption. Thus, many shelters receiving greater than expected rescue support seem to do little more than allow rescues to save the day. The million dollar question is why do these shelters receive very little rescue help? As you will see below, Vorhees Animal Orphanage adopts out many cats and is doing a good job. On the other hand, Gloucester County Animal Shelter pursues an aggressive catch and kill policy for feral cats and allegedly killed kittens within 3 days of arriving at the shelter per this letter to a local newspaper. Northern Ocean Animal Facility failed to send even a single cat to a rescue which indicates either poor rescue outreach or an error in its reported numbers. As a result, shelters receiving too little rescue help may or may not be doing their part to get that assistance. Rescue groups and shelters with extra space should pull cats from kill shelters with the highest rescue “target” numbers and deficits in the table below. One exception is Associated Humane Societies – Newark given Associated Humane Societies two other facilities have more than enough room to help the Newark location. If shelters not needing rescue support get that extra help, these shelters will not take the steps necessary to properly run their facilities. As a result of enabling poorly performing shelters and not pulling cats from truly space constrained facilities, rescuing cats from shelters with enough space leads to less lifesaving. 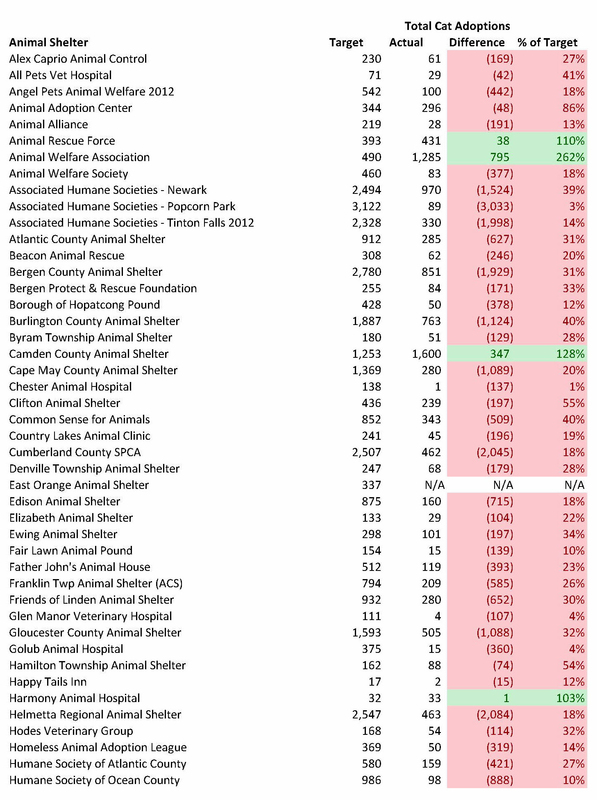 The table below compares the number of cats from New Jersey and nearby states each animal shelter should adopt out with the estimated number of cats actually adopted out. High kill shelters with very limited space as well as rescue oriented organizations may look better than they actually are. For example, the model assumes the mix of cats facilities are adopting out are the same as the types of cats these groups take in. However, if these shelters only adopt out a very small number of cats due to limited physical capacity, the cats adopted out may be highly adoptable ones with much shorter lengths of stay compared to the majority of cats these facilities impound. Similarly, many rescue oriented shelters likely pull much easier to adopt cats than the bulk of cats needing to get rescued from local facilities. Thus, the results from shelters with very limited capacity and rescue oriented organizations may look better than they actually are. Few organizations reached or exceeded their adoption targets. Specifically, only 6 out of 101 shelters met the cat adoption goals computed by the Life Saving Model. Thus, the overwhelming number of New Jersey animal shelters need to step up their adoption efforts. Two rescue oriented shelters exceeded their adoption targets. Animal Welfare Association had the most impressive results by far. This facility adopted out nearly 3 times the number of cats targeted by the Life Saving Model. Based on the the types of cats currently available for adoption and the cat death rate of 11%, Animal Welfare Association does not seem to just take in highly sought after cats. Animal Welfare Association has reasonable normal adoption fees of $95 for kittens and $65 for adult cats, but runs reduced and no adoption fee promotions as well. Animal Welfare Association also waives fees for certain cats who may take longer to adopt out, such as cats who are older or have behavioral or health issues. Furthermore, the shelter’s “Best Friends” program allows people who adopt a cat to pay just $25 for a second cat who is 1 year or older. Additionally, Animal Welfare Association uses an open adoption process focused on properly matching animals and people rather than an overly judgmental procedure based on black and white rules. To aid its open adoptions process, Animal Welfare Association uses the ASPCA’s Feline-ality program. Animal Welfare Association’s adoption rate increased by 20% and its cat length of stay decreased by 23 days after the shelter implemented the Feline-ality program. Finally, Animal Welfare Association installed perches in their cat enclosures to provide cats more vertical space which keeps the cats happier and more adoptable. Animal Rescue Force also exceeded its adoption targets and a key part of its success is using three different adoption sites, two of which are not in a traditional setting. Thus, Animal Welfare Association and Animal Rescue Force used a variety of strategies to exceed their cat adoption targets. Several animal control shelters also exceeded their adoption targets. Camden County Animal Shelter adopted out more animals than expected. This shelter’s normal cat adoption fees are reasonable and the organization also uses four different Petsmart locations and one Petco store to adopt out cats. However, the shelter can likely further increase its cat adoptions if it abandons its cumbersome adoption process and uses an open adoptions process like Animal Welfare Association’s Feline-ality program. Vorhees Animal Orphanage also exceeded its adoption goal. Vorhees Animal Orphanage’s operating hours include weekday evenings and weekends which allows working people to adopt. This shelter’s normal adoption fees are quite reasonable. For example, cats at the shelter for 6 months or longer are $30, senior cats are $50, adult cats are $65, kittens are $100 and both senior citizens and military personnel receive a 25% discount on adoption fees. Additionally, Vorhees Animal Orphanage adopts cats out at one Petco store and two PetValu locations. Mercerville Animal Hospital also exceeded its adoption target in 2012 (no statistics reported in 2013) and had an animal control contract for the first seven months of the year. A rescue group, Animals in Distress, runs the adoption program. The shelter has a reasonable $75 adoption fee, which includes testing for Feline leukemia and immunodeficiency virus (“FIV”). Additionally, the shelter adopts animals out during weekday evenings which is convenient for working people and the cats are kept in an environment which provides lots of stimulation. Harmony Animal Hospital also exceeded its adoption target and charges no adoption fee. Thus, several animal control shelters exceeded their cat adoption goals and therefore prove these adoption targets are achievable. Rescues should focus on pulling animals from Camden County Animal Shelter and Vorhees Animal Orphanage. Both these shelters have high cat death rates and their need for rescues greatly exceeds the amount of animals actually pulled from these organizations. While some of these cats may be feral and therefore not adoptable, many other cats surely could be rescued from the two shelters. Given these shelters are adopting animals out at a good rate, rescues and other other shelters should help these facilities out by pulling more cats from Camden County Animal Shelter and Vorhees Animal Orphanage. Some municipal animal control shelters may be doing a better job with cats than the numbers below indicate. In some cases, municipalities may frown on government run shelters using taxpayer funds to rescue cats from elsewhere. For example, Perth Amboy Animal Shelter had a significant adoption shortfall, but only used a small percentage of its cat capacity. In other words, it is quite likely this shelter adopted out its cats quite quickly, but failed to meet its adoption target due to not using enough of its space. This shelter saved 93% of its cats compared to the previous shelter management’s reported live release rate of just 42%. Similarly, this shelter adopted out more than 10 times as many cats in 2013 than the previous management did a few years before. My suggestion to shelters like Perth Amboy Animal Shelter is to find ways to use more of your facility’s capacity to expand your lifesaving work to other areas. For example, these shelters should consider taking in animals from other shelters for a fee or even contracting with other municipalities. Many shelters with the ability to help other local shelters fail to do so. New Jersey animal shelters have the potential to rescue and adopt out more than 3.5 times as many cats as the number of cats unnecessarily dying in the state’s animal shelters. Approximately 20-50% (depending on how capacity used for the year is estimated) of the adoption shortfall is due to shelters not using their existing capacity to adopt out their own cats or rescue cats from space constrained nearby facilities. The other 50-80% of the adoption shortfall is due to shelters not adopting out animals as quickly as these organizations should. Thus, New Jersey animal shelters fail to even come close to their adoption potential. Associated Humane Societies performance is particularly disappointing. Specifically, Associated Humane Societies has the physical capacity to significantly reduce the killing of healthy and treatable cats. Associated Humane Societies adoption shortfall of 6,555 cats is 34% of the 19,078 cats unnecessarily losing their lives in New Jersey animal shelters. Associated Humane Societies has the funding to reach these adoption targets as the organization took in over $8 million of revenue last year. This works out to nearly $500 of revenue per dog and cat I project the shelter should take in per my Life Saving Model. As a comparison, Nevada Humane Society, KC Pet Project, and Upper Peninsula Animal Welfare Society, which are no kill open admission shelters, took in only $254-$415 of revenue per dog and cat. Activists wanting to increase life saving in New Jersey should focus on changing Associated Humane Societies’ policies given the lifesaving potential of this organization. Several other shelters had significant adoption shortfalls. Bergen County Animal Shelter’s adoption shortfall of 1,929 cats is quite disappointing. Bergen County is among the top 1% of the nation’s wealthiest counties and received $430 of funding per dog and cat I project the shelter should take in based on direct support from Bergen County. If the revenue from the local charity that helps the shelter is counted, the funding increases to $483 per dog and cat the shelter should take in. Helmetta Regional Animal Shelter’s and Montclair Township Animal Shelter’s adoption shortfalls of 2,084 and 1,323 cats are not surprising given the widely documented problems at these facilities during this time. Cumberland County SPCA’s adoption shortfall of 2,045 cats is consistent with its overly restrictive adoption process. Thus, many shelters with the ability to adopt out many cats are failing to do so. Virtually all New Jersey animal shelters are failing to rescue the number of cats they should. 98 of the 102 shelters should rescue some cats from other local shelters. In fact, 64 of the 98 shelters with targeted excess capacity failed to rescue even a single cat from other animal shelters. Of the 98 shelters with the space to rescue cats from nearby shelters, only Animal Welfare Association met or exceeded its cat rescue target. Thus, nearly all New Jersey animal shelters with targeted excess capacity are failing to do their share in ending the killing of healthy and treatable cats. Shelters should not use anti-feral cat laws as an excuse for failing to institute innovative programs. Too many times shelters blame anti-feral cat ordinances for their outrageously high cat kill rates. However, my analysis proves cats are not dying in New Jersey’s shelter system due to too many cats coming into the state’s shelter system. While TNR certainly would reduce cat intake and make saving lives easier, our state’s shelter system has more than enough space to handle the number of cats that come in. Shelters need to implement key programs, such as foster care, high volume adoptions, and vaccination upon intake. Additionally, shelters need to stay open weeknights and weekends when working people can adopt. Similarly, shelters should use innovative marketing, customer friendly open adoption processes, multiple off-site adoption locations, and frequent discounted adoption promotions to quickly move cats into good homes. Thus, anti-TNR ordinances do not prevent shelters from implementing other life saving policies. Regional kitten nurseries and ringworm wards are the practical solution to saving these vulnerable cats. Given the New Jersey shelter systems has significant excess capacity to care for cats, certain shelters should convert some of that excess space for use as kitten nurseries and ringworm wards. Creating regional centers to care for unweaned kittens and cats with ringworm would allow the programs to run at a large enough scale to work efficiently. Shelters, such as Associated Humane Societies -Popcorn Park, Monmouth SPCA, and St. Huberts – Madison appear to have the space and financial resources to implement these programs. Furthermore, the Animal Welfare Federation of New Jersey (“AWFNJ”) should take the steps needed to create kitten nurseries and ringworm wards in regional centers throughout the state. Surely, the AWFNJ has the connections to convince key decision makers to implement these programs and obtain any necessary funding. Thus, New Jersey shelter leaders must immediately take the steps needed to save the large numbers of treatable kittens and cats with ringworm in our state’s shelters. 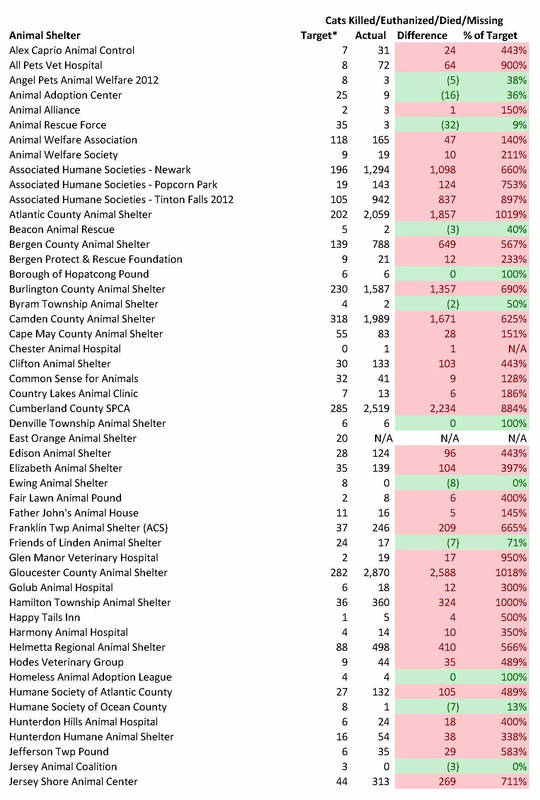 The findings from this analysis mandate New Jersey animal shelters change their ways. While TNR remains a significant issue, most shelters are clearly not taking steps to save large numbers of healthy and treatable cats. Many shelters are not vaccinating upon intake, charging excessive adoption fees, making it too difficult to adopt, not being open when working people can go to shelters, leaving cat enclosures empty, and not using barn cat, foster care, kitten nursery and ringworm ward programs. Simply put, too many shelters are not doing what it takes to save lives. With nearly half of all cats entering New Jersey’s shelters dying or going missing, our state’s shelters are failing their cats. Each shelter’s community cat intake (i.e. owner surrenders, strays, cruelty cases), number of cats returned to owners, and maximum cat capacity were taken from its 2013 “Shelter/Pound Annual Report” submitted to the New Jersey Department of Health. 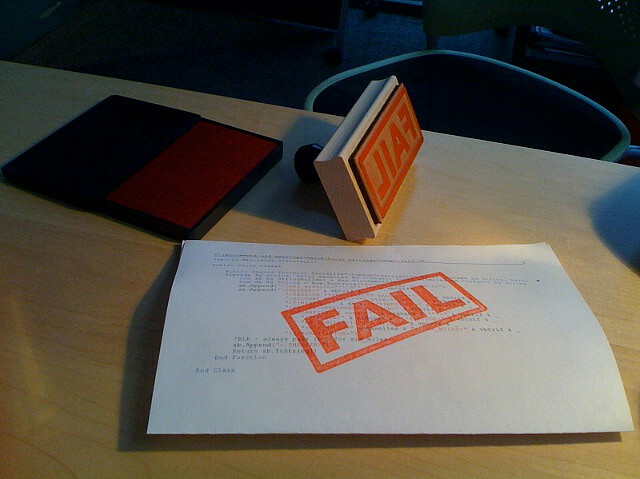 2012 “Shelter/Pound Annual Reports” were used for shelters failing to submit reports in 2013. 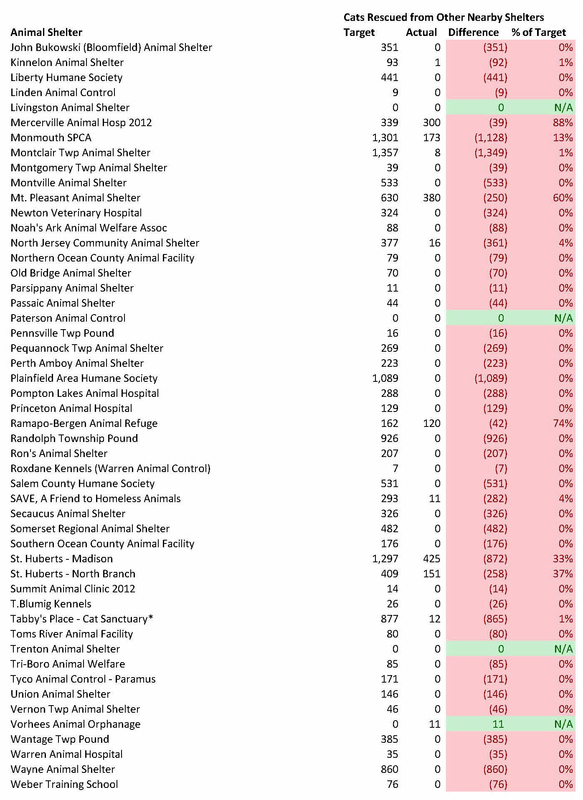 East Orange Animal Shelter’s 2013 data was obtained from a local news article due to the shelter failing to submit any “Shelter/Pound Annual Reports.” Unfortunately, 2014 data will not be available until Fall 2015. Community cat intake and cats returned to owners were initially estimated for each month by dividing the annual figures by 12. In order to take into account the extra space in low intake months and reduced space in high intake months, we multiply that number by each month’s percentage of the average month. For example, assume 240 cats were taken in during the year and the average month equals 20 cats (240/12). In July, the cat intake is 120% higher than the average month and we therefore multiply 20 cats by 1.2 to equal 24 cats. If 120 cats were returned to owners during the year, the estimated number of cats returned to owners in July would equal 12 cats (120/12 = 10; 10*1.2). 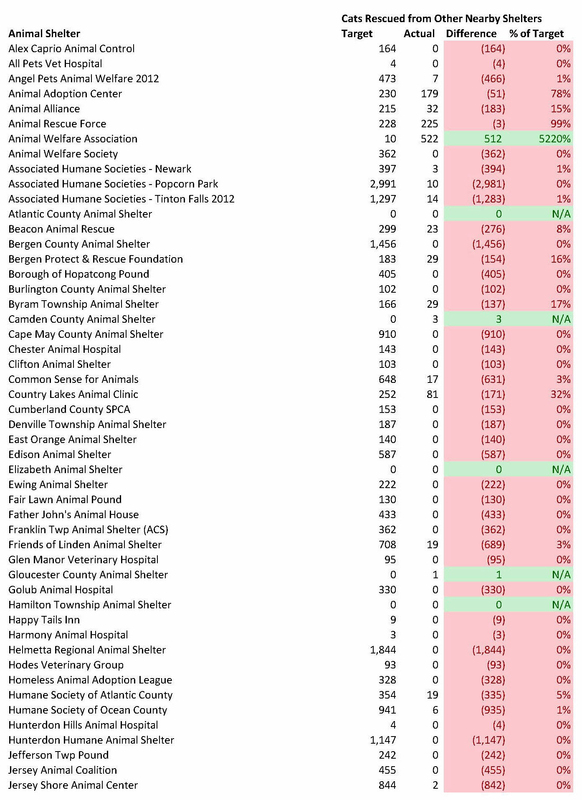 The monthly intake percentages were based off 2013 cat intake data on the New York Animal Care & Control web site. The average length of stay used for adopted community cats was 42 days. This estimate was roughly halfway between the average cat length of stay figures for a number of no kill animal control shelters. For example, the average length of stay for cats in recent years was 14.6 days at Texas’s Williamson County Animal Shelter, less than 18 days at Nevada Humane Society, 21 days at Colorado’s Longmont Humane Society, 33 days (32 for cats and 34 for kittens) at New Hampshire SPCA, 35 days at Montana’s Flathead County Animal Shelter, 41 days at Colorado’s Ark Valley Humane Society, and 61 days for adopted cats only at New York’s Tompkins County SPCA. While the average length of stay of adopted cats at these shelters other than Tompkins County SPCA may have been slightly higher since this data is for all cats and not just those adopted, the difference is not likely significant given adoptions represent most of the outcomes at these shelters. 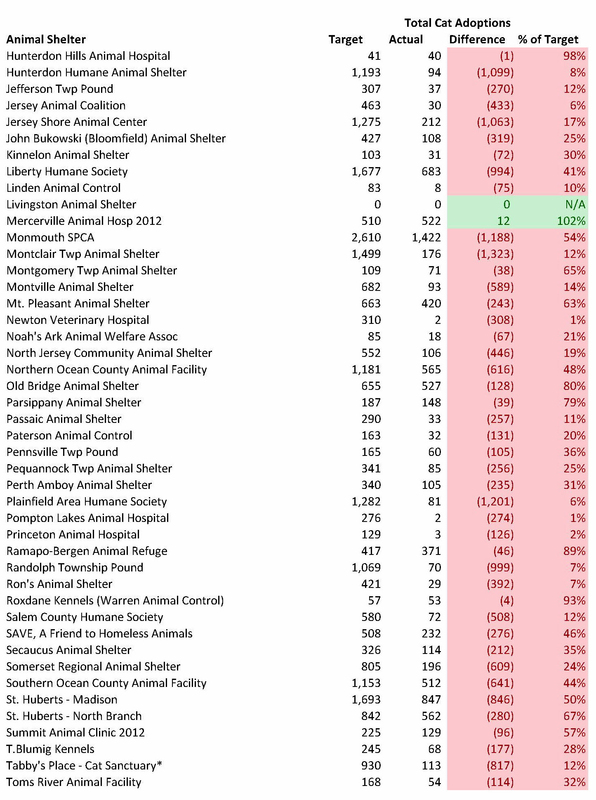 Unfortunately, I was not able to break down the adoption length of stay figures by age or breed for New Jersey’s shelters like I did in my analysis on dogs due to a lack of detailed cat intake data at New Jersey animal shelters. Upon reviewing cats up for adoption at several New Jersey animal control shelters and a few of the high performing facilities above, I did not see any significant differences in types of cats taken in. In the future, I hope to refine this analysis further. Shelters with excess capacity are assumed to use the extra space to rescue and adopt out cats from other New Jersey animal shelters. Given some of these cats will be young and highly vulnerable kittens, I assume 5% of these rescues will be euthanized for humane reasons. I used 5% based off Austin Pets Alive’s and Austin Humane Society’s weighted average cat euthanasia rate in 2013. These two shelters pull many cats from Austin Animal Services, which is the city’s animal control shelter, and their cat euthanasia rate is a reasonable proxy for the percentage of hopelessly suffering cats rescued from animal control shelters. To the extent all healthy and treatable New Jersey animal shelter cats are saved, I assume additional cats are pulled from nearby states. The average length of stay for rescued and adopted cats is the same as the cats taken in by animal control shelters (i.e. 42 days). Similarly, I used 8 days as the average length of stay for rescued and euthanized cats from other shelters. The Life Saving Model assumes shelters can adopt out animals outside their service territory. New Jersey is the most densely populated state in the nation and shelters can easily adopt out cats to people outside their service area. For example, people from outside the service territory of New Jersey shelters adopt animals from these facilities and at off-site adoption locations. Based on this assumption, shelters with a lot of capacity relative to the population in their service area have higher targeted per capita adoption rates (i.e. based on the population in their service area). However, these shelters can easily adopt out animals to people outside the area they take animals from.